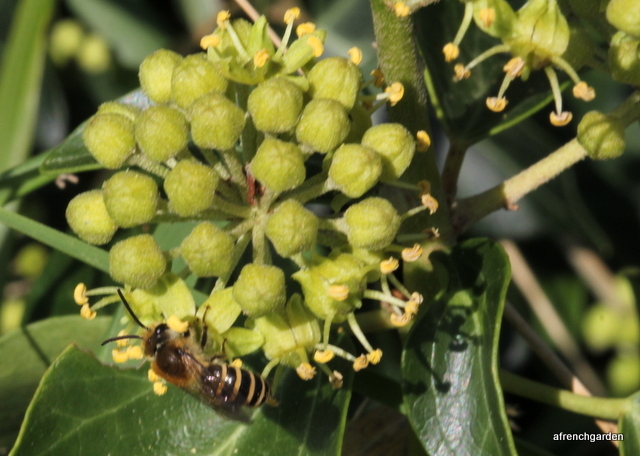 My neighbour does not have an ox that I covet but he does have a colony of Ivy bees (Colletes hederae) in front of these bushes. He was concerned that our bees were coming out of the soil in his garden. I had a good idea that it was a colony of Ivy bees and went round to confirm, taking my camera with me. The colony had just started to appear with lots of males flying around frantically searching for females to mate with. From even a short distance away they look very similar to honey bees and you have to look closely to see their banded abdomen. 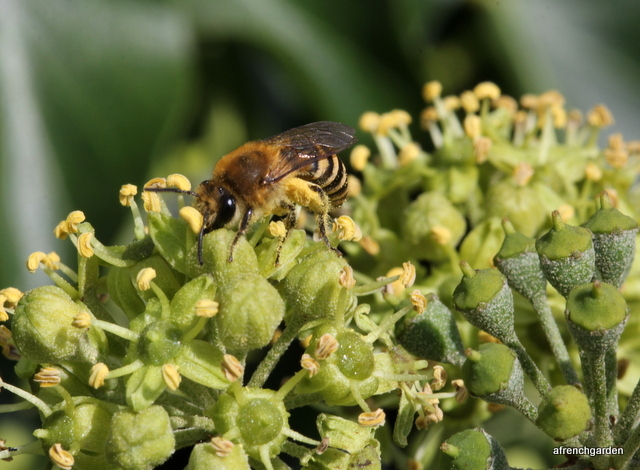 I must admit that I did feel envious of having a colony of Ivy bees in your own garden. I would appreciate them much more than he does. His mother was born in the house and she had never noticed them. This is a female, I think she is beautiful. The bees, the butterflies and the flowers are all appreciating the sun and temperatures of 26 degrees in the afternoons after the cool, rainy start to September. I am even mellowing and starting to appreciate the Tithonia rotundifolia – the tall, orange, sunflower-like plant in the above photograph. It has gone on flowering and producing more heads than I thought it would, however, I cannot say it attracts pollinators more than a lot of the other flowers. My aster Audrey is the big attraction in the garden at the moment. This is a Brimstone butterfly ( Gonepteryx rhamni ). This is a Meadow Brown (Maniola jurtina) and the most common butterfly around here in the garden and outside from early in the year. 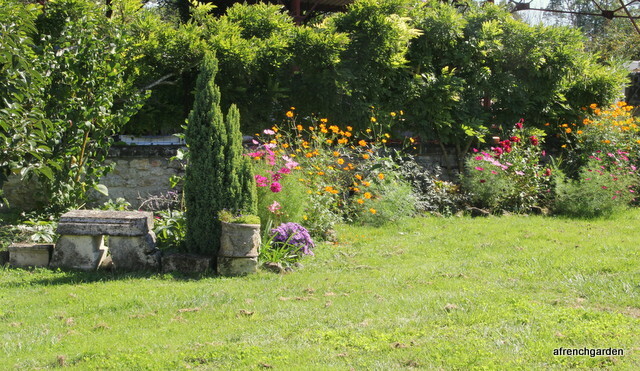 The Asters attract a range of butterflies. They also attract this cuckoo bee (Epeolus cruciger) which lays its eggs in other bees nests taking advantage of food stores left for the host bees young. Most cuckoo bees are specific to one bee genus which in this case is the Colletes. I cannot forget the honey bees that come to the Asters as they make the most noise. After the Asters finish flowering they push out new rooted shoots to expand. These are very easy to pull up and transplant and I have been able to increase my stock from the original single plant. I know I am somewhat bee-centered but when you watch the antics of some other animals like this cabbage butterfly you wonder how the species survives. This poor female butterfly was doing her best to raise her abdomen and co-operate but the male was perhaps not the best choice. I think he managed eventually to accomplish his duty but it looked as if his big white wings were getting in the way. Autumn is a busy time in the garden. The Butternut squash have done well but we have not lifted them yet. The tomatoes gave a super crop this year and my favourite is still Sungold as it is one of the first to fruit and the last to give up. However, despite its superior flavour a lot of people prefer the look of small red tomatoes. We grew a lot of “second hand” tomatoes which were raised by friends and planted in a random fashion that did not allow much comparison apart from saying they all tasted good and I have lots of tomato sauce frozen in the freezer for soups and other dishes in the coming months. The strawberries keep producing too, although the raspberries are just about finished. 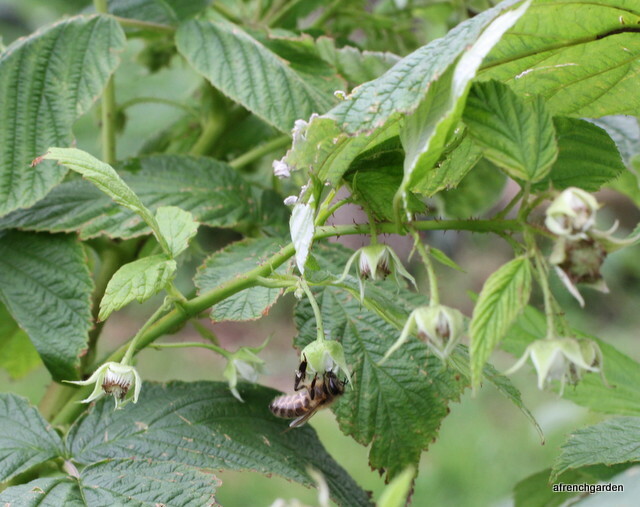 On the subject of food production – we have our first Gojii berries. We planted the bushes as I read that the bees love the flowers. Mmn. 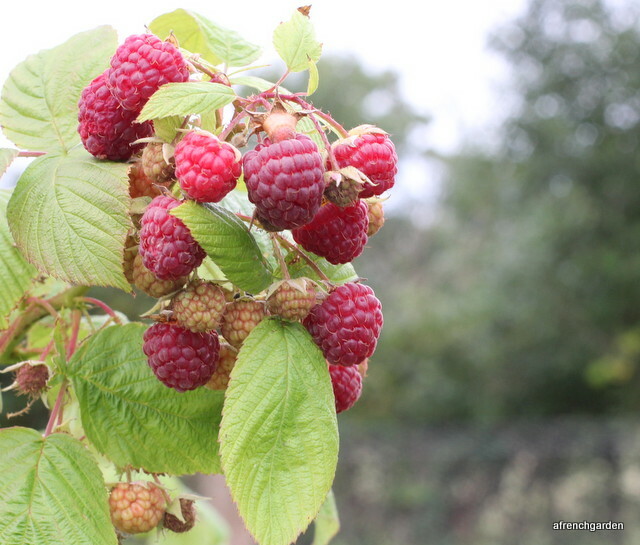 so far I have not seen the bushes crowded with bees but that might be because the bushes are still small, at least I had the consolation prize of being able to crop the fresh berries. I had never tasted the fresh berries and being charitable I would call the flavour “disappointing”. Perhaps a good choice of fruit for people who prefer a pretty colour to a full flavour? Categories: Garden | Tags: Brimstone butterfly, butternut squash, colletes hederae, gojii berries, ivy bee, mating Cabbage butterflies, sungold tomatoes | Permalink. It’s the end of September and the garden is looking good after a week of really heavy rain in the first part of the month. It was the rain that puts a smile on gardeners faces and it fell mostly at night time with the daytime temperatures staying pleasantly warm. Kourosh’s half price Maya the bee seeds are still attracting the bees. In general the Cosmos are doing a lot to provide lots of colour at this time of year. I lost my Heptacodium jasminoides last year and was quite shocked that it could have left me as I had bought it in 2007. However, last autumn I replaced it with the same species but called the alternative name Heptacodium micanioides. It has flowered in its first year with me so I should be happy but it does not seem to be quite the magnet that the other one was for the bees. 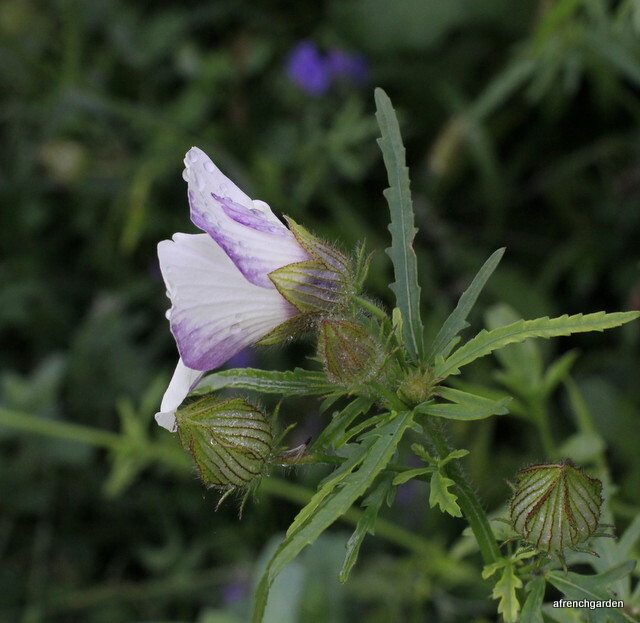 It’s flowers are still as beautiful and perfumed – it just has a bit of growing up to do. 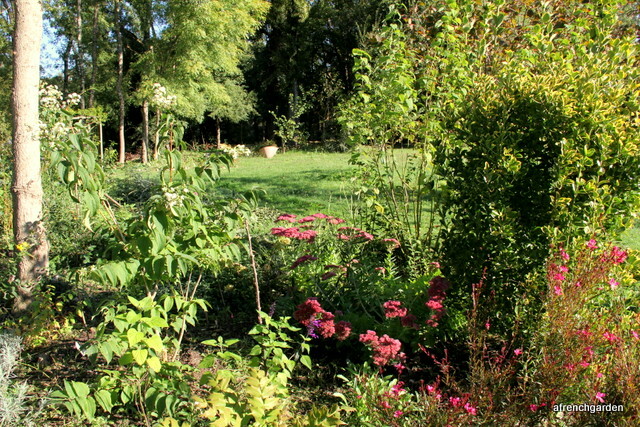 On the right of the Heptacodium is one of my Sedums. 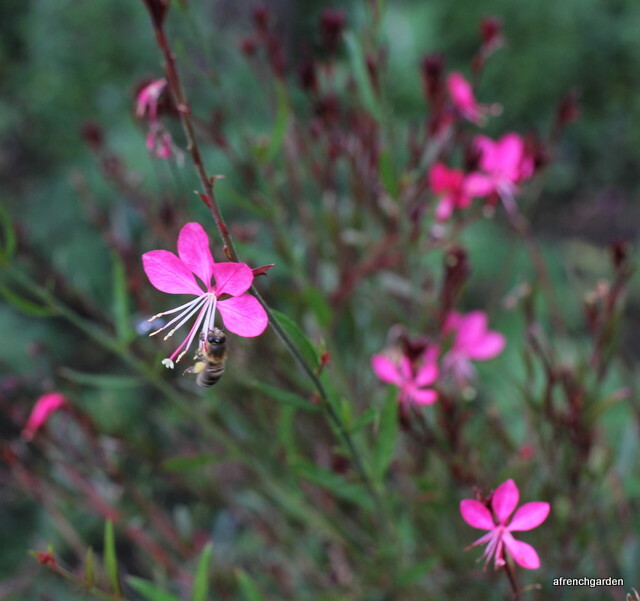 I have several of these in the garden and they are excellent, colourful, easy plants to grow – only the bees are totally uninterested in them. Would someone please recommend a large Sedum that will attract the bees? My next disappointment is on the left of the Sedum – a red Gaura (Siskiyou Pink). It just does not have the pull for the bees as my white ones. 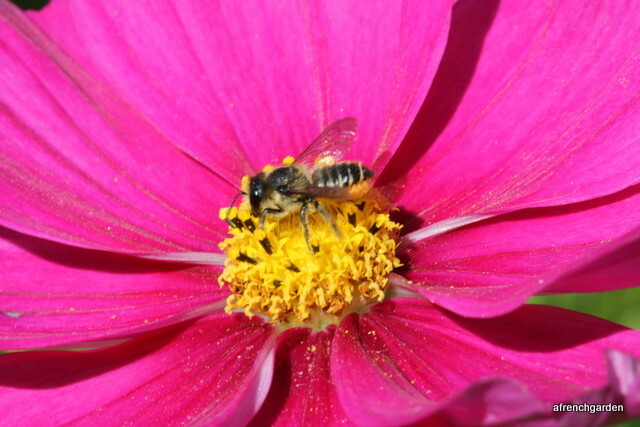 Just comparative, the bees will still come and relieve the flowers of their pollen. Enough complaining! 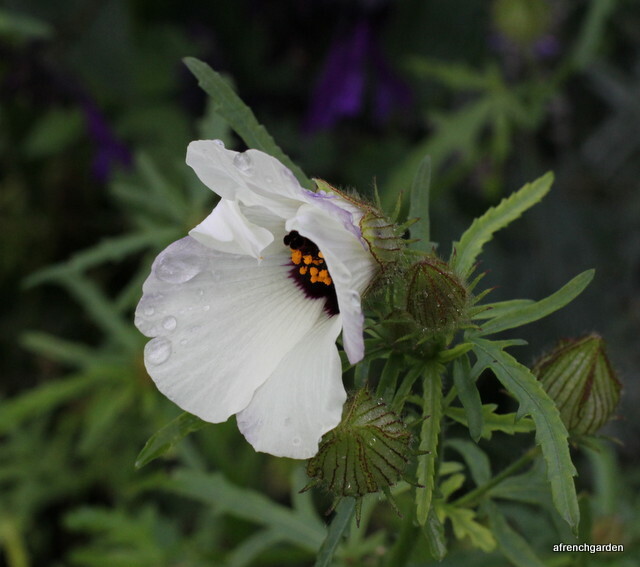 I am still enchanted with my Flower of an Hour (Hibiscus trionum). It looks good whether you view it from the front or from the back! I don’t go too much for very fancy flowers and I think my sister notices this on her visits. Her tastes are more flamboyant and she tries to spice up the garden by tempting me with a new seed or plant. 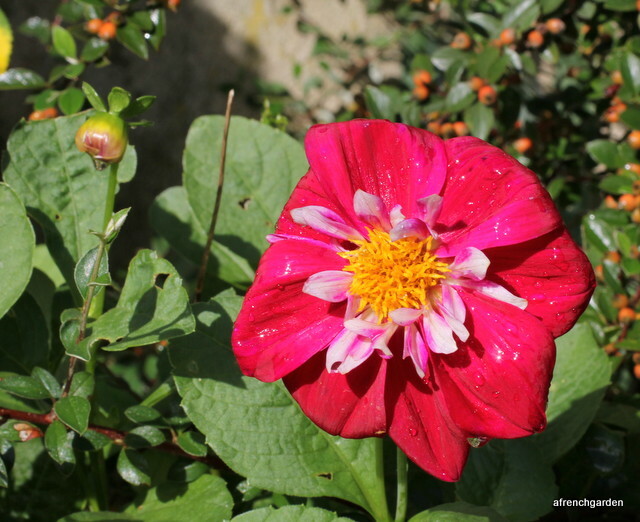 This Dahlia is from a packet of seeds she shared with me called “Yanky Doodle Dandy”. Actually some of them are not bad and they leave the centre open for the pollinators so I cannot complain. 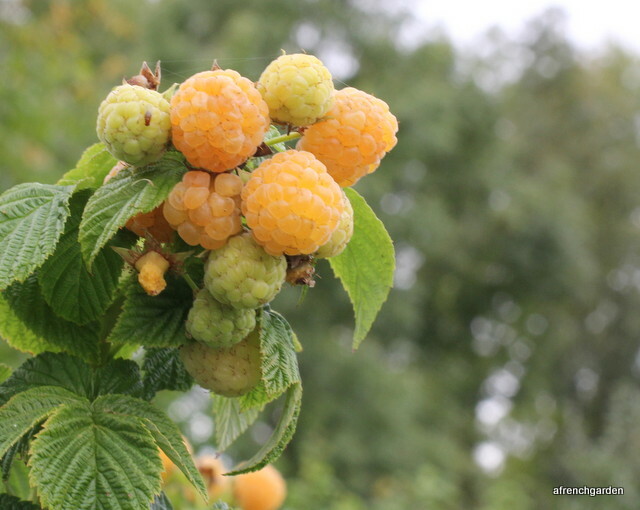 The rain brought on a new flush of raspberries. I find these yellow Fallgold sweeter than the pink ones. But for decoration or desserts the pink ones do look better on a plate. The bees don’t seem to have a preference. They must produce tasty nectar as the flowers are visited every morning. 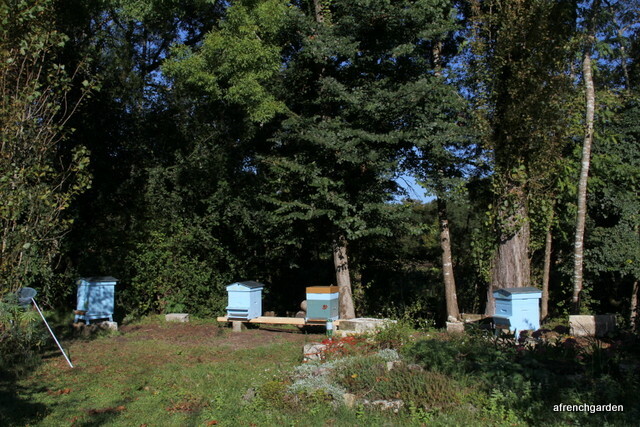 Kourosh has moved two of the hives further back in an attempt to take them more out of the sun. It is only a partial success as they are facing the morning sun. As you can see, the net is still being well used to trap the hornets. There is still no let up from their constant attack. The scent of ivy flowers is ever present when we walk around here but we do not notice a lot of ivy pollen going into the hives. There is a lot of wild mustard flowers (Sinapis arvensis) around and some of the pollen matches that. 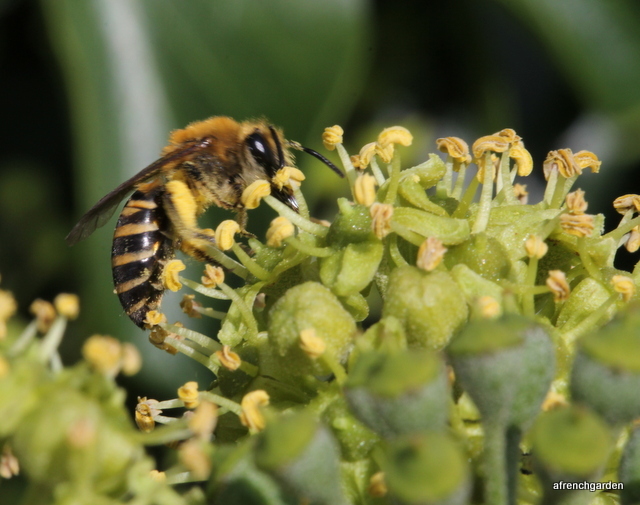 The Ivy bee (Colletes hedera) gathers almost solely the ivy pollen. I saw this female at the same nest site as I had seen last year (https://beesinafrenchgarden.wordpress.com/2014/10/12/la-bourgade-revisited/). It is just as extensive as it was but not as busy. The whole area had been soaked by a week of heavy rain just at the time that the males would normally leaving the nests. The heavy rain that brought relief to the garden and brought out the flowers in abundance was perhaps not so well timed for the Ivy bees. 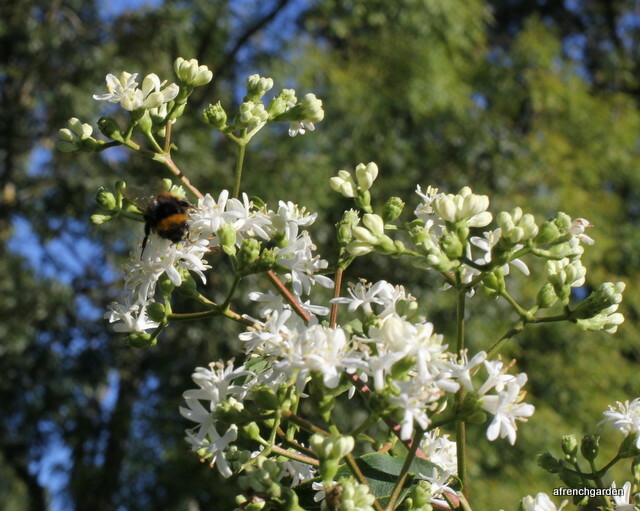 Categories: Garden | Tags: colletes hederae, French Garden, garden, gardening, heptacodium micanioides, nature | Permalink. WARNING – This post contains a heavy bee content. I know only too well that not everyone is so besotted with bees as I am, so you are warned. In fact, I am not sure I know myself what drives me to wait with baited breath in the hot sun beside a hedge of ivy. just because I want to catch a glimpse of Colletes hederae. 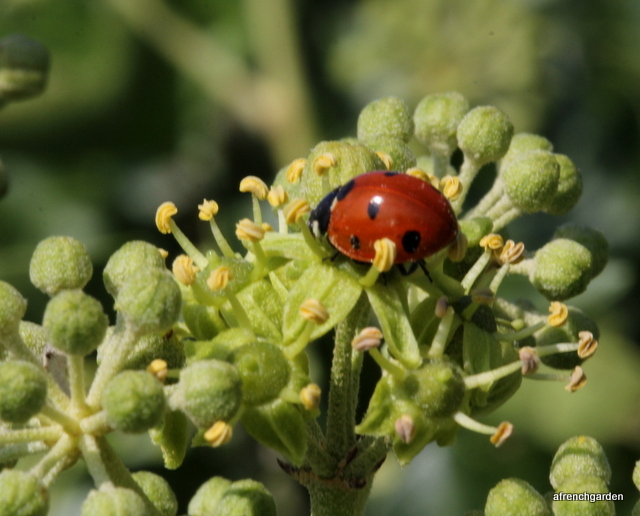 There are lots of honey bees and other insects, like the ladybird that catch my eye and I click out of restlessness. 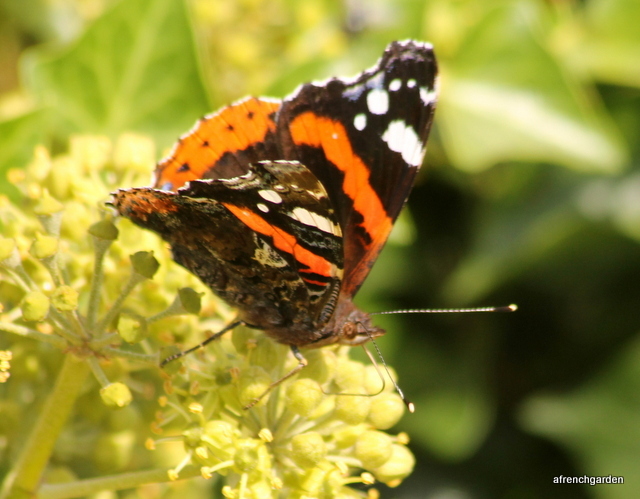 Butterflies are just as much drawn to the nectar source as the bees, but they are not what I am looking for today. The trouble is when I cannot see the bee I am looking for I get distracted by the other visitors. 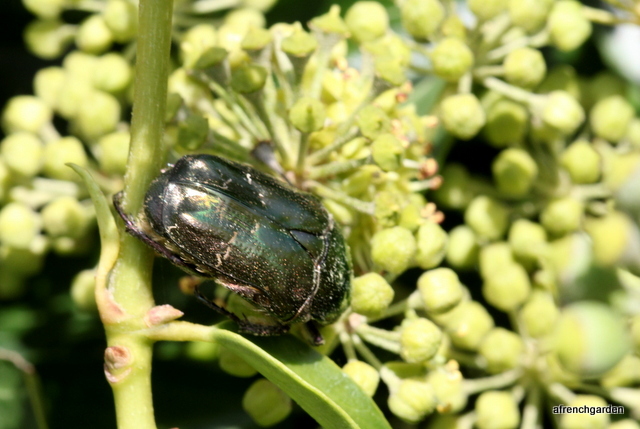 I haven’t seen as many chafers this year but there is one on the ivy. Click. 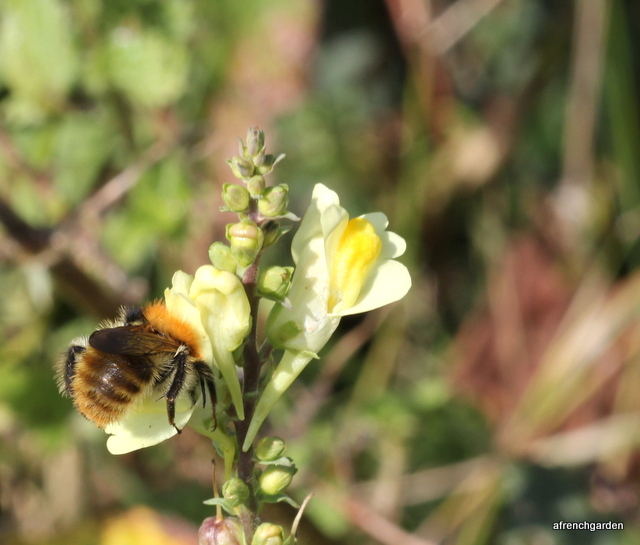 The cute bumble on the toadflax gets her picture taken too! And I cannot help marvelling at the best bee mimic I have ever seen. It only lacks a pair of long antenna to be just about spot on. 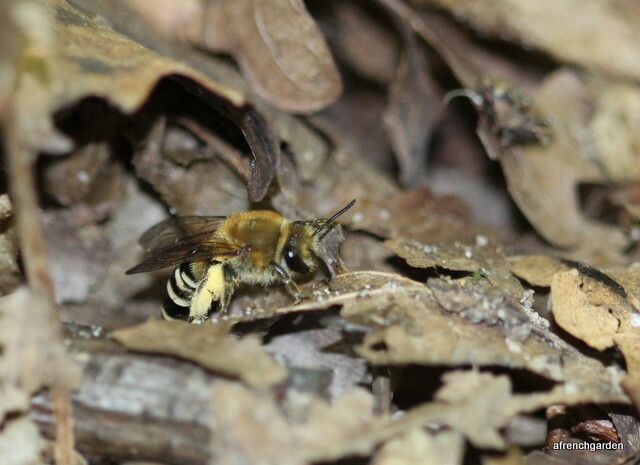 Just as I was wondering if I was missing them, I saw my first, and I think probably a male Colletes hederae with his long antenna. And there are more, a female this time with plenty of pollen on her hind legs. 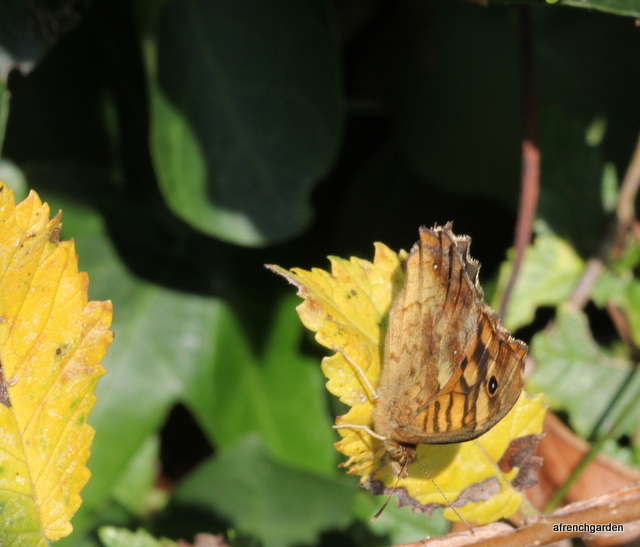 They do not fly until late summer and should stay around into October. 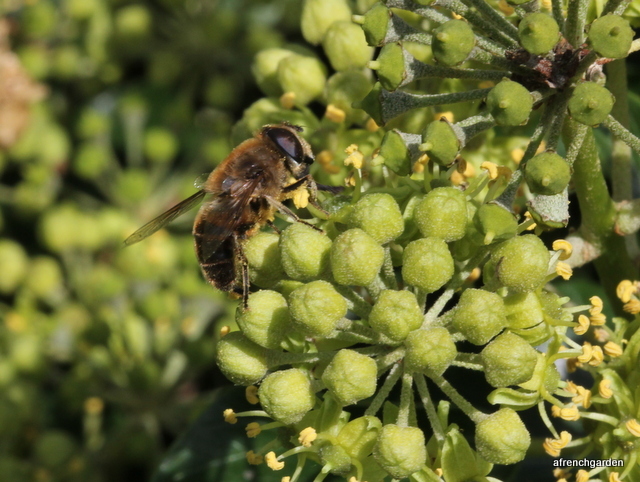 They gather pollen mainly from ivy which seems an odd strategy but as it is late flowering they will have less competition from other solitary bees (but not from honey bees) and perhaps less problems with parasites. 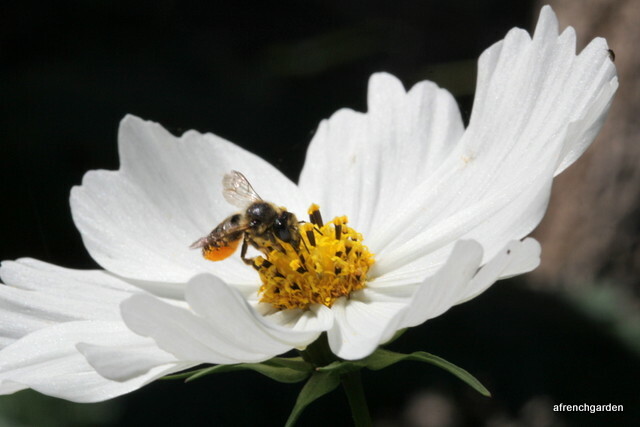 They are ground nesting bees, digging tunnels often in large groups. I have never found a site near me but there must be one around as there is plenty of ivy. I am delighted to see them again and I won’t be passing any ivy now on our walks without checking it out. I don’t understand why it gives me a thrill to find them, but it does. It is worth the wait to see them again, even though my nearest and dearest find it all rather strange. 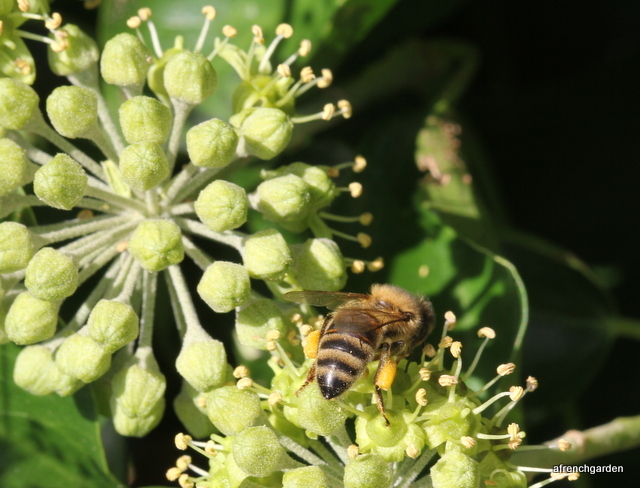 Categories: Bees | Tags: colletes hederae, ivy, ivy bee, nature | Permalink.